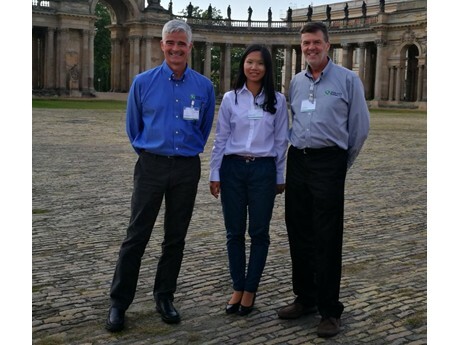 On September 3, 2017, Scott and Michael Walker of Walker Bros, Inc., along with Dr. Wenjing Chen, joined representatives from 22 countries in Potsdam, Germany for the 14th International Asparagus Symposium. Over the course of the three-day event, researchers, growers and government officials assembled to discuss the milestones that are contributing to asparagus research and growth. Following meetings and notable keynote presentations, Walker Bros, Inc. spent the rest of the week visiting asparagus growers and local towns throughout Germany. Scott and Michael took the opportunity to learn about new research methods and network with asparagus representatives from other countries such as China, Peru and Mexico. Dr. Wenjing Chen, Walker Bros, Inc.’s newest international representative, demonstrated her extensive horticultural experience as one of the symposium’s speakers. Dr. Chen has over six years of scientific research experience in plant physiology, cultivation and variety evaluation. She received her PhD from the Poznan University of Life Sciences in Horticulture Science, focusing on the “morphological and physiological characteristics of young plants and the yielding of some asparagus cultivars” for her thesis. Prior to joining Walker Bros, Inc., Dr. Chen was an international cooperation coordinator for the Chinese Asparagus Industry Association, where she built rapport with oversea asparagus seed companies and research institutes. As the international representative for Walker Bros, Inc., she will be traveling to different countries to educate growers about Walker Bros varieties, and will work with growers to set up asparagus trials. With over three years’ experience in building agricultural industry cooperation domestically and abroad, as well as her ability to speak four languages, Dr. Wenjing Chen is a valuable addition to the Walker Bros, Inc. team. Walker Bros, Inc. is strengthening its international presence to spread awareness about its newest male hybrid asparagus variety, the Walker Deluxe F1. This new release has impressive yields, excellent spear quality, and high disease tolerance, which makes it an excellent choice for maximum profits. It is adapted to temperate, warm and cool climates and is highly resistant to rust, fusarium, and other foliar diseases. The Walker Deluxe F1 is an early season variety and can be used for fresh market and processing. It is available in seeds and crowns, but crowns are currently sold out for 2017 and seed is very limited. In addition to the release of the Walker Deluxe F1, Walker Bros is currently experiencing great success with experimental hybrid varieties. The hybrids performed extremely well in a Washington State trial, out-yielding some of the current varieties in the world. Refer to the chart for the yield results in their second year of harvest, which demonstrates promising results for these new Walker Bros asparagus hybrids. Similar trials will be arranged in the near future by Dr. Wenjing Chen.